1 Builder or Taurus; One of two clusters (cluster). 2 Builder or Taurus; A bell barrow; on its axis was a large rectangular feature. 2c Basket or Algol; Bush barrow row on the field edge; and Normanton Down barrows group. Southward lies North Kite enclosure. 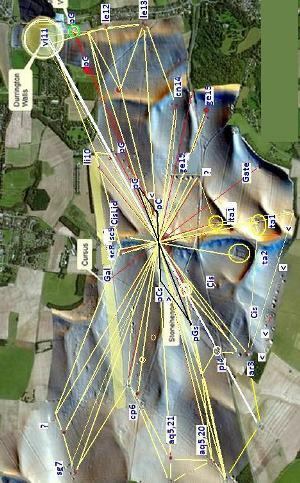 4 King or Pisces; A cluster (under fields, near road A303); and Stonehenge; and a long barrow. This axis is opposite type 11 Durringon Walls, the largest feature. 4p Galactic South Pole on a group forming a rectangle (typical of 4 and 5). 5a Priest or Aquarius; Winterbourne-Stoke cluster, varied (varicoloured), large (large). 5b Priest or Aquarius; A barrow and a pit (varicoloured). 6 Exile or Capricornus; Fargo henge bell barrow, near the cursus west end; near the invisible axial centre (ingress); near road A344. 7 Child or Sagittarius; A group of circles; and the Lesser Cursus. 7g Galactic Centre; Cursus centre, and cursus group of bell barrows, and a bell barrow (compare to the Axum terraces, in the Civil Outposts chapter). 8 Healer or Scorpius; Durrington Down long barrow. 9 Healer or Scorpius; A cluster (more typical of 2 opposite); to the north is Larkhill. 9c Basket Lid or Lupus; A cluster and a pond barrow. 10 Teacher or Libra; A circle. 11 Womb or Virgo; Durrington Walls, a large round walled village (interior). Its opposite in this landscape is at type 4 Stonehenge. North-east lies Durrington village. 11p Galactic Pole; Old King barrows; on its axis east is Woodhenge. 12 Heart or Leo; A long barrow south of the Woodhenge series, near the Durrington south road; and a large feature, perhaps concentric, near road A345. 13 Heart or Leo; A circle?, near road A345. 14 Mixer or Cancer; A small cluster. 15 Maker or Gemini; New King barrows row; ENE lies Vespasian’s camp; east lies Amesbury; SW lies the river end of the procession. 15g Gate near the Avenue past the 15 row; and as a bell barrow. The ecliptic pole or axial centre is apparently unmarked as usual. The celestial pole is on a barrow. The celestial south pole may be west of the invisible axial centre, placing summer in Leo-Cancer, thus spring and the cultural inspiration in Age Taurus-Aries, about BC 1500, long before most of the work (see dating issues below). After Roman evacuation, Britons harked back to Celtic culture and sites (Fergusson 1872), but with a Roman eye for civil grandeur. Their Norse conquerors built most of these structures, perhaps with Pict labourers, as they did in Orkney (Wickham-Jones 2011). Stonehenge’s last phase expresses Age Aries-Pisces (see the Stonehenge monument analysis above), thus the last work may be after BC 80.